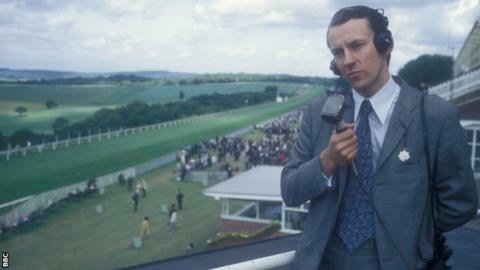 Former BBC racing broadcaster and commentator Julian Wilson has died aged 73 following a long illness. Wilson joined the BBC in 1966 and went on to cover some of the most iconic moments in racing history. He spent 32 years with the corporation until he retired in 1997. Generations of horse racing followers grew up with Julian Wilson as the face of the sport on BBC television for over 30 years from 1966. The son of the Daily Mirror sports writer Peter Wilson, and a contemporary at Harrow school of pundit John McCririck, Wilson brought to the screens an unrivalled knowledge and deep passion for racing and for the formbook. His patrician tones and serious, no-frills style might not be to the taste of every programme controller today, but it carried with it great authority. Clare Balding, who succeeded Wilson at the BBC, was among those to pay tribute, tweeting: "Very sad news. I owe Julian Wilson my first break in TV and will forever be grateful." Former Classic-winning jockey Jimmy Lindley, who worked with Wilson for many years at the BBC, said: "He was the most thorough professional I've ever come across." Wilson also owned several horses with a degree of success and was racing manager for the late Sir Clement Freud. Lindley added: "He was probably the most astute person that's ever been involved in racing. "We were great friends. I'm so sorry he's no longer with us. "He was a wonderful man and a credit to his profession and the biggest compliment I can pay him is that along with Sir Peter O'Sullevan, they put it all together. Racing was very professionally run in those days on TV, as it is now, those two set the standard. "He loved life, wine and people and was a great man." Wilson leaves behind his second wife, Alison, and has a son from his first marriage. BBC horse racing correspondent Cornelius Lysaght said: "Wilson's range of racing interests spread further than the media, taking in writing, punting and racehorse ownership: his Tumbledownwind was successful in York's prestigious Gimcrack Stakes in 1977 and Tykeyvor won at Royal Ascot (1996). "Outspoken on a range of racing issues, including fixtures staged on Sundays (of which he didn't approve), he famously insisted, in a 1998 memoir, of a feeling of betrayal by Sir Peter O'Sullevan over the veteran commentator's retirement plans. "Wilson had hoped to succeed him, but ended up going in 1997 aged 57 a month after O'Sullevan quit aged 79. "Wiz was what you might call old school, and was full of bluster, most of it harmless. "Once, when we were both staying with a leading trainer, I got the most beautiful, only recently decorated, main spare bedroom, and he opted for much smaller quarters, simply because, he claimed, the smell of fresh paint would keep him awake. "He went further, producing a special pillow and breakfast cereal. We all laughed but he saw no joke. "Julian Wilson was an individual who was happy not to be everyone's cup of tea, but to me he was unfailingly helpful and encouraging."